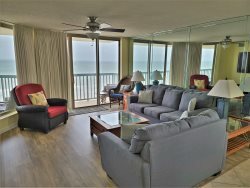 Rent AbundanSea A for your beach vacation and enjoy an abundance of space, bedrooms, ocean views, and FUN! Enjoy the Ocean Drive Difference by starting your vacation immediately upon arrival, as this property comes with fresh bed linens/bath towels, the beds are already made up for you, and the departure maid service are all included in your price. This large home is loaded with great amenities and features a private pool and hot tub, large living room and kitchen, game room with billiards, eight large bedrooms, and seven full bathrooms. A big dining table and island provides seating for family meals, and two refrigerators hold enough food for your stay. The game room also has a large bar, cable TV, and a bathroom close by so your group can enjoy hours of fun. On the upper two levels, two master bedrooms give you comfortable king swing beds, ocean views, balcony access, and big private bathrooms. Across from the master bedrooms are rooms with queen beds, ocean views, balcony access, and hall bath access. Down the hall are the rear bedrooms with more king and queen beds, and additional hall baths. There are 3 levels total, each with a front and rear balcony, for a total of 6 balconies to enjoy ocean views, sunshine, and the cool ocean breeze. The rear balconies overlook the pool so you can keep an eye on the kids while enjoying the peaceful surroundings. Additional amenities include cable TV in living room, game room, and all bedrooms, WiFi, and parking for up to 6 vehicles. This property is just 2 blocks from Sea Mountain Highway where restaurants, convenience stores, grocery store, gift shops, and liquor store are located. The beach is right across the street and easily accessed though a public walkway. Call now or book online and begin looking forward to your stay at AbundanSea A!